Patch Cable 2 Right Angled plugs 15cm Ibanez. .. Instrument cable 3.05m with 2 straight plugs IBANEZ. .. 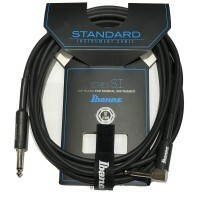 Instrument cable 3.05m with straight and right angle plugs IBANEZ. .. Instrument cable 4.58m with 2 straight plugs IBANEZ. .. Instrument cable 4.58m with straight and right angle plugs IBANEZ. .. Instrument cable 1.50m with 2 straight plugs Dunlop. .. Instrument cable 6.10m with 2 straight plugs IBANEZ. .. Instrument cable 6.10m with straight and right angle plugs IBANEZ. .. Instrument cable 3.05m with 2 straight plugs RADIAL. .. Instrument cable 4.58m with 2 straight plugs RADIAL. ..